With Lily Collins, Jamie Campbell Bower, Robert Sheehan, CCH Pounder, Jonathan Rhys Meyers. Written by Jessica Postigo. Directed by Harald Zwart. Rated PG-13 for intense sequences of fantasy violence and action, and some suggestive content. 130 minutes. 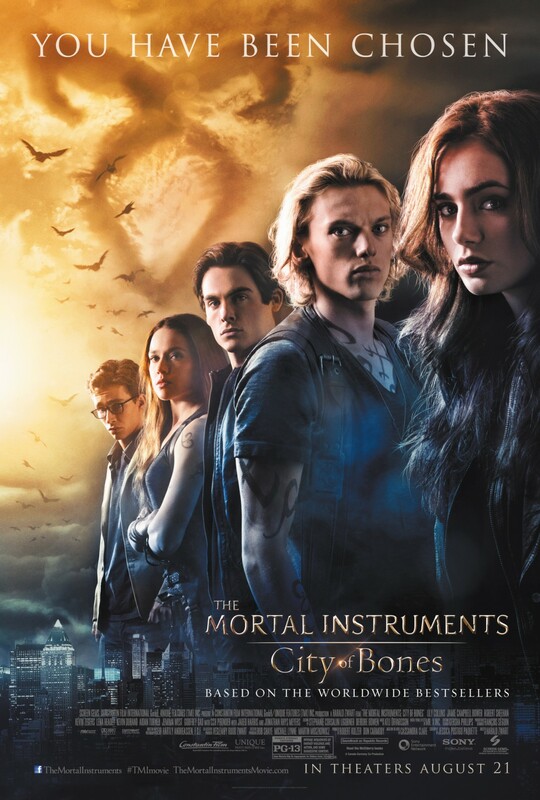 THE MORTAL INSTRUMENTS: CITY OF BONES is yet another movie based on a YA (young adult) book series hoping to follow the trail set by the “Harry Potter” and “Twilight” movies, and which “The Hunger Games” series seems well on its way to emulating. Will it succeed? That trail is also littered with failure (“Beautiful Creatures,” “Cirque du Freak: The Vampire’s Assistant,” “I Am Number Four,” “Alex Rider: Operation Stormbreaker”), so clearly there’s no guarantee. There’s something a bit generic about this latest attempt, perhaps because we’ve seen these elements mixed and matched so many times. The young lead (check) Clary (Lily Collins) discovers that she has a secret heritage (check) and hidden abilities (check) that will be key to preventing evil from taking over the world (check). She has a loyal friend (check) named Simon (Robert Sheehan) who becomes a romantic rival (check) to the mysterious Jace (Jamie Campbell Bower) who is part of her new reality (check). There are also vampires (check), werewolves (check), and an evil dark lord (check) named Valentine. When her mother (Lena Headey) disappears after being attacked by demons and Clary sees her mother’s friend Luke (Aidan Turner) being tortured, she accepts the assistance of Jace for sanctuary at the Institute, a secret magical lair (check) which the mundane world of non-magical people pass by without noticing (check). There she meets Hodge (Jared Harris), their wise, old, but eccentric leader (check). She learns of the secret her mother has been hiding from her and why she has come to the special attention (check) of the evil Valentine. The adult cast also provides strong support. CCH Pounder (Syfy’s “Warehouse 13”) is the mysterious fortune teller in the building who knows more than she lets on. Jared Harris is suitably odd and twitchy as Hodge, while Jonathan Rhys Meyers clearly relishes the villainous role, easily going from smooth seducer to battling swordsman.